As my friend Rich and I stood in the verdent understory admiring the spectacular panicles of red buckeye punctuating the green lushness, a small brown flower on a leafless branch above me caught my eye. “Pawpaw!” I exclaimed, perhaps partly in amazement that it took us awhile to notice the trees that were, in fact, all around us. Pawpaw (Asimina triloba) is a member of the only temperate genus in the otherwise exclusively tropical and subtropical family Annonaceae (Custard Apple Family). Although not nearly as restricted in occurrence in Missouri as the red buckeyes with which they were growing, they are nevertheless always a treat to see. 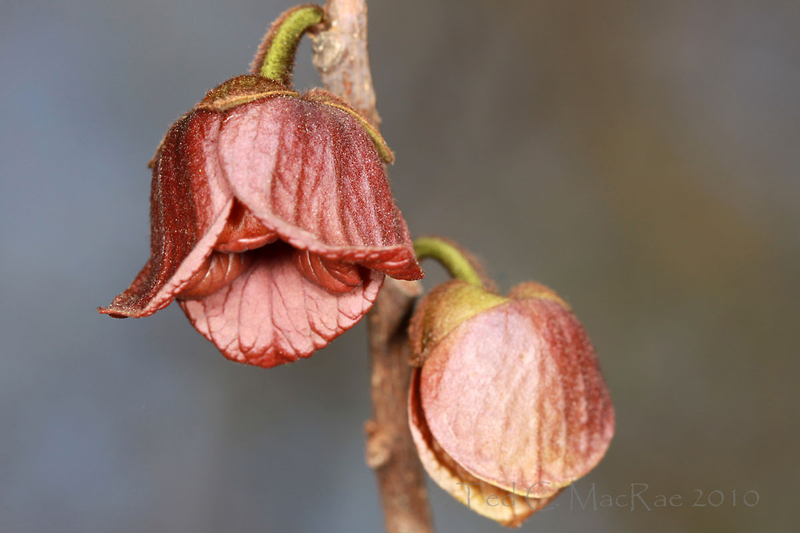 Scattered throughout the state, they can be found growing in bottomland forests, ravines in mesic upland forests, along woodland streams, and at bases of bluffs (Yatskievych 2006). Pawpaws are, of course, famous for their large edible fruits, sometimes called Indian bananas, Missouri bananas, Michigan bananas, [insert eastern state here] bananas, etc. Technically, however, the pawpaw fruit is a berry, since it is derived from a single pistil and has multiple seeds embedded within the pulpy matrix. I’ve not tried the fruit myself, not for lack of desire but rather an inability to find them when they ripen in fall before the birds and mammals get to them. Some effort has been made to cultivate the plant for fruit production, but low fruit set seems to be a persistent problem due to reproductive self-incompatibility. Pawpaw also famously serves as the larval food plant for the zebra swallowtail butterfly, Eurytides marcellus (family Papilionidae). Beyond this, however, there seem to be not many insects associated with the plant. I have collected dead wood of pawpaw in an effort to determine the species of wood-boring beetle species that are associated with it. The only species I’ve reared is the longhorned beetle, Elaphidion mucronatum (whose common name “spined oak borer” belies the fact that it is one of the most polyphagous of all North American species), and two other longhorned beetles, Eupogonius pauper and Urgleptes querci (also highly polyphagous), have also been reported being reared from dead wood of this plant. I have not associated any jewel beetles with pawpaw, nor have any such associations been reported in the literature. It would appear that woodboring beetles are not fond of the soft, weak wood of pawpaw, perhaps due to the plant’s annonaceous acetogenins with known pesticidal qualities (Ratnayake et al. 1993) (acetogenins are also under investigation as anti-cancer drugs). Other poisonous compounds, chiefly alkaloids, are found in various parts of the plant, especially the seeds and bark, and likely play a role in herbivore defense. Insect pollinators also seem to be infrequent, as I have not noted any insects on its flowers. 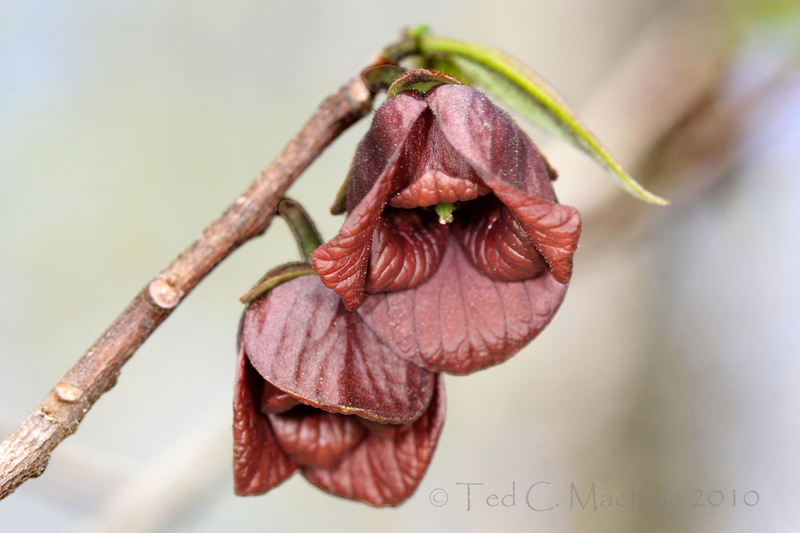 Most members of the family are pollinated by beetles (Yatskievych 2006), but the meat-colored, downward-facing, not-so-sweet-smelling flowers of pawpaw suggest pollination by flies, perhaps those attracted to carrion. This entry was posted in Annonaceae, Cerambycidae, Coleoptera, Lepidoptera, Papilionidae and tagged beetles, Botany, butterflies, entomology, insects, longhorned beetles, Missouri, nature, science, trees, wildflowers. Bookmark the permalink. Yes, they have a fleshy look and feel as well. To my nose these have an aroma of fermenting fruit or other vegetable matter. I think these, fleshy appearance notwithstanding, are pollinated by fungus gnats — like another maroon flower that booms at the same season, Asarum canadense. Interesting – yes, I could go with fermenting to describe the smell. Certainly not putrid like some of the other true carrion-associate attractors. Supposedly, pawpaws can be grown as cold as USDA Zone 4, but I”ve been trying to grow them for years and they just don’t seem to take hold this far north. They survive the winter after a fashion, but don’t really seem to be able to put on any growth year to year. I expect that they need more heat units in the summer than we actually get in the Upper Peninsula of Michigan. I’d imagine a number of species that do well in southern Michigan don’t handle the UP too well. I wonder how well a pawpaw will do as a houseplant? I planted two types of Paw Paw this year after attending a class on native fruits. The instructor mentioned plants have serious trouble growing and producing fruit in the same year. Too bad this seems to be such a difficult fruit to cultivate. It would be nice to have a readily available, native ‘tropical’ fruit to enjoy. The main reason pawpaws aren’t commercially grown is that they don’t ship or store well at all. They’re not terribly hard to cultivate – see this Kentucky State University website for a lot of info on growing pawpaws. Many widely grown fruit trees are self-incompatible, such as apples and pears. In the case of pawpaws, growers may have to attract flies to increase pollination by simply hanging some meat in the trees. As for growing them productively in the U.P., I would expect it could be done, at least in a protected full sun location, since they’re native as far north as Muskegon County. The trick might be to obtain a native genotype to guarantee hardiness since the species is so wide-ranging. Neat flowers! I don’t remember ever tasting the fruit, but their soursop tropical relatives are delicious, with the same sweet banana+other fruit taste that pawpaws are said to have. Thanks, Mary. I’d sure be interested in seeing some flowers of the tropical species if you ever happen upon them. Adults lay eggs in early spring, so check the foliage now for gorgeous blue-green larvae with transverse striping – during the day they like to hang out on the undersides of the leaves along the midrib. Check out this BugGuide photo to see what the larvae look like. About 12-15 years ago I planted two bare-root PawPaws in my backyard here in the Piedmont of Georgia. The depleted red clay of a former cotton field is not exactly prime habitat for this tree and it took a dozen years for them to bloom. I got nothing the first year and the second year of blooming I plucked a flower off one and rubbed it against the stigmas of several flowers on another plant. They set fruit but the critters got to it before it was ripe. All three bloomed this spring, but no pollination seems to have happened. Fifty years ago I tasted PawPaw and I’m eager to eat my own some year. And a few Zebra Swallowtails would be a nice bonus. Hi Dale – long time! They like pretty rich, moist conditions – I’d imagine that Georgia clay isn’t too good for them. Still, I’m more than impressed with your tenacity! Delicious fruits – wish they grew easily in the UK. I remember eating some in the 1990s – in Oregon of all places. A definitely a taste of the tropics for the temperate zone. I’ll have to make a better effort to get to them this fall before the birds! Growing up in Oz, we grew and ate paw-paws (papayas). My husband (US-born) and I had to untangle that one. But, interesting also, is you mention that the custard apple belongs to the family Annonaceae. I’d talk about custard apples and he didn’t know what I was talking about. It’s a small world. Hi Joan. I’d never really heard of custard apples myself before learning about them in the botanical sense. I sure wish we had ready access to papaya here – one of my favorite fruits to enjoy whenever I travel south. Pingback: Gravity’s Rainbow » Blog Archive » A New Berry Go Round!